It is important to remember that statistically predicting the NCAA tournament, despite what FiveThirtyEight and others may tell you, is largely a fool’s errand. Most of these games are close to coin tosses anyway, and one tiny swing can change everything. For example, last year in the first round Team X was losing to Team Y by 2 with 5 seconds left and its center, who shot free throws at a 50% rate, was at the line for two shots. Team Y was the smarter pick, right? Well, Team X was UConn, and their center, Amida Brimah, made both of those free throws and they went onto beat Team Y, St. Joseph’s, in overtime… and then win the national championship. To put that in perspective, if you picked last year’s national champion to lose in the first round, you were smart. 1. In three of Duke’s four losses, opponents have shot above 44% shooting 3’s. Utah is 9th in the country in 3 point shooting percentage. 2. North Carolina is 4-6 against teams in the kenpom top 100 who are also in the top 100 in opponents’ time per possession. Harvard and Wofford would fall into this category. Arkansas and Wisconsin wouldn’t. 3. Eastern Washington draws most of its success from being 14th in the country in effective field goal percentage. But they have only played 2 teams in the top 150 in the country in defensive efficiency, and they lost to both of them. 4. If the season ended right now, Wisconsin would have the most efficient offense since the statistic started being measured. 5. Arkansas is 302nd in the country at keeping opponents off the offensive glass. North Carolina is 6th in the country in offensive rebounding rate. 6. VCU is second in the country in steal%, but Ohio State is 25th best at preventing opponents from getting steals. 7. Ohio State has played 9 games against teams in the kenpom top 50, and has been 2-7 in those games, and 0-7 against kenpom top 25 teams. VCU is 30th and Arizona is 2nd. 8. Georgia State is 319th in the country in opponents’ offensive rebounding rate. Baylor is 2nd in the country in offensive rebounding rate. 9. To the degree that Villanova has struggled this year, it has been against teams who defend 3s well; they are 4-1 against teams in the top 50 of opponent 3P%, with 2 of those wins being “close wins” (within 5 or OT). UVA is 19th in this statistic, Oklahoma is 31st, UNI is 46th, and LSU is 48th. 10. That being said, in all 3 of UVA’s losses this season, their opponents have had success shooting 3s. Villanova is 24th in the country in 3P% and Michigan State is 26th. 11. Davidson gets the 4th highest percentage of their points in the country from 3’s and is 17th best in the country at 3P%. Iowa’s 3P% defense is only 77th best in the country. Gonzaga’s is 74th. 12. Davidson is 2-6 against teams in the top 66 in the country in blocks per possession (i.e. teams with a strong inside presence). Iowa is 37th in this category. 14. Eastern Washington’s Tyler Harvey made more threes this season than five teams. 15. Georgia State’s starting backcourt has played a combined three seasons for major conference teams (Ryan Harrow: Kentucky/NC State, and Kevin Ware: Louisville). The other member of the backcourt is two-time conference POY R.J. Hunter. 16. SMU’s opponents score 39.2% of their points from behind the arc, which is 2nd highest in the country. SMU defends 3’s at a 32.2% mark, 69th best in the country. 17. Wyoming is most experienced team in the field, starting four seniors and one junior. 18. St. John’s is 51st in the country in defensive efficiency, but this was anchored by center Chris Obekpa, who was 5th in the country in blocks per game. Obekpa has been suspended for the tournament. 19. In 6 games without point guard Chris Jones, Louisville has been 3-3 and only cracked D1 average in offensive efficiency twice. Jones will not be playing in the tournament. 20. Maryland was 6-4 in away games. 21. Kansas’s regular season strength of schedule was the highest SOS rating on kenpom.com since 2002. 22. Northern Iowa’s Seth Tuttle and BYU’s Tyler Haws were first and second in the country in offensive rating this season. 23. North Dakota State point guard Lawrence Alexander has come out of just 2 of the team’s last 8 games, one of which went into overtime. 24. Providence’s point guard Kris Dunn is 4th in the country in steals rate and first in assist rate. 25. Stephen F. Austin has the 289th best SOS this season. The only games they’ve played against NCAA tournament teams happened in November (UNI, Xavier, Baylor; all losses). 26. Baylor’s Rico Gathers is the only player in the tournament—or a major conference—to average a double-double, with 11.7 PPG and 11.6 RPG. LSU’s Jordan Mickey was .02 rebounds short. 27. Indiana has four players that have made at least five 3’s in a game. 28. Indiana gets 36.1% of its points from behind the arc, which is the 22nd highest proportion in the country. They also shoot 40.3%, which is 7th best. Wichita State defends 3’s at just below the D1 average. 29. San Diego State is 4th in the country in defensive efficiency and the only offensive category they rank in the top 50 in is offensive rebounding rate; St. John’s is 62nd in offensive efficiency and the second worst team in the field at keeping opponents off the glass. 30. Aside from last year’s UConn team, all national champions have been in the top 25 in offensive and defensive efficiency. The teams that fit that bill this year are: Kentucky, Arizona, Villanova, Wichita State, Northern Iowa, and Gonzaga. 31. Not starting a player above 6’6”, Stephen F. Austin is the shortest team in the tournament, followed by Wofford and Oklahoma State. 32. At 20.9 seconds, San Diego State forces its opponents into the longest average possessions of any team in the country. 33. Georgia’s Charles Mann has the highest free throw rate in the tournament and has shot double-digit free throws in 6 games this season. Michigan State allows opponents to the line at just about the D1 average rate. 34. Kentucky is the only team in the field whose offensive and defensive efficiency numbers are both in the top 10 in the country. 35. West Virginia is a team of extremes. They are the second worst tournament team in effective field goal percentage, but 4th in the country in offensive rebounding rate. 36. Furthermore, WVU is the 2nd worst team in the field in opponents’ effective field goal percentage and the worst team in the entire country in opponents’ free throw rate, but they are also the best team in the country in steals% and turnovers forced %. 37. Notre Dame, Davidson, BYU and Indiana are all in the top 10 in offensive efficiency and outside of the top 100 in defensive efficiency. 38. Shooting just 63% from the line, San Diego State has the worst free throw percentage in the field. Michigan State (63.3%) isn’t far behind. 39. BYU plays at the highest tempo of any team in the field. UVA plays at the slowest. 40. Kenpom rates luck as the degree to which your current record overstates what your expected record should be. Maryland, Wofford and Harvard are all in the top in this metric. 41. On the other end of the spectrum, Texas, Xavier, and Utah are the unluckiest teams in the field this year. 42. In case you weren’t already aware, 7’6” Mamadou Ndiaye plays 55% of UC Irvine’s minutes at center (his backup, Ioannis Dimakopoulos, is 7’2”). 43. SMU is 2-6 against teams in the NCAA tournament field. They are 27-0 against teams not in the field. 44. Georgetown defends 3’s at the 259th best mark in the country and is 4-2 (with one win by 3 and one in OT) against the 4 teams it has played that have 3P% in the top 50 in the country. Eastern Washington shoots 3’s at the 14th best percentage in the country. 45. When Duke’s Tyus Jones posts an offensive rating below 80, the Blue Devils are 3-3. When he has a rating above 80, they are 26-1. 46. Notre Dame has the shortest bench of any team in the tournament. Luckily, they almost never get in trouble, with the second lowest opponents’ free throw rate in the country. 47. Perhaps UCLA’s biggest weakness is that its opponents score the 34.6% of their points against them from 3’s a mark that is the 15th highest proportion in the country, and they have the 238th best 3 point defense in terms of percentage. SMU, however, has the 3rd lowest 3PA/FGA attempted in the country. 48. Texas’s opponents shoot the lowest percentage from inside the arc that kenpom has measured since its inception in 2002, and it has the highest blocks% in the country. Butler is one of the most often blocked teams in the field. 49. Baylor’s 13th most efficient offense comes exclusively from shooting 3’s at the 35th best rate in the country and getting offensive rebounds at the second best rate. The only opponent it could play before the sweet 16 that is above the D1 average in defending both of those strengths is BYU. 50. New Mexico State is the team that neutralizes the 3 most in the country, between its opponents getting the 2nd smallest percentage of their points from 3’s in the country and their holding opponents to just 29.5% from beyond the arc, which is 7th best. Kansas is a below average 2 point shooting team. 52. Perhaps New Mexico State’s biggest weakness is their turnover rate, which is 329th in the country. Kansas, however, forces turnovers at the 272nd highest rate in the country. 53. Combining the nation’s 19th most efficient offense with its 5th highest turnovers forced rate, Stephen F. Austin has the makings of a giant-killer this year. 54. Northern Iowa is the most experienced single digit seed in the field (i.e. its players are the oldest). 55. Arizona had the highest defensive rebounding rate in the country this year, which would bode well for them should they play offensive rebounding specialists Baylor or North Carolina. 56. Valparaiso was one of 6 teams this year to post offensive and defensive rebounding rates in the top 50. Maryland ranked above 100th in both categories. 57. Eastern Washington, Boise State, Davidson, Villanova and North Florida were the only teams this year to be in the top 50 in both 3P% and percentage of 3’s attempted out of total shots. 58. Despite coming close against Kentucky, Georgia is 0-6 against teams in the NCAA tournament field. 59. According to kenpom, Dayton vs. Boise State would be a 50/50 toss-up. But the game being a home game for Dayton gives them a 65% chance at winning. 60. Momentum going into the tournament is not often a statistically sound predictive factor, but Oklahoma State has lost 6 of its last 7 games and Oregon has won 8 of its last 9. 61. Virginia is 20-1 in games in which Justin Anderson played at least 20 minutes. Anderson appears to be healthy and ready to play regular minutes for the tournament. 62. Utah is 11-7 when Brandon Taylor posts an offensive rating below his average. 63. Harvard has won a game each of its last two NCAA tournaments. 64. 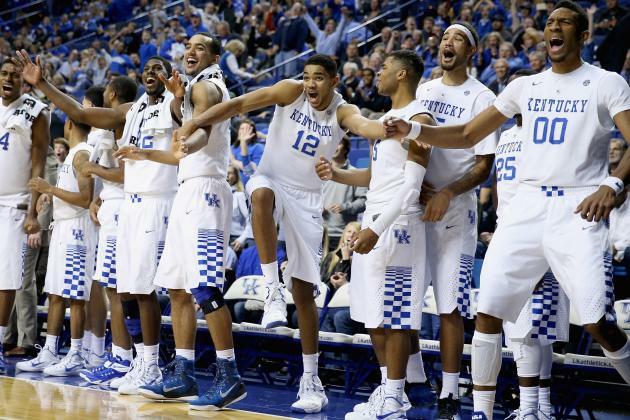 In case, you weren’t paying attention, Kentucky hasn’t lost this year. 65. A 16 seed has never beaten a 1 seed. This post was edited at 12:15 ET to reflect that Dayton is playing Boise State, not Mississippi, as an earlier version stated. I love this post every year. This is all fascinating nerdtistics, but let’s put it in English, and tell us who to pick, and why!